Enjoying all that Chichester Harbour has to offer from the water is a great pleasure. However, it's important that to ensure that alongside the enjoyment you act safely and responsibly on tenders just as you would taking your main vessel to sea. While seemingly leisurely, you shouldn't forget that tenders can be dangerous and potentially fatal. 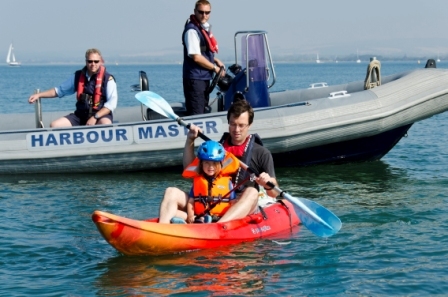 The number one rule for using your tender is to always wear a life jacket - always! If things don't go according to plan, a life jacket could be the difference between a lucky escape and a fatal accident. So enjoy the Harbour and make the most of the stunning Area of Outstanding Natural Beauty, but remember to stay safe. Paddlesports, such as kayaking, paddle boarding and canoeing are an excellent, low impact, healthy and fun way of exploring the Harbour. However, when these craft get too close to birdlife and seals, they can cause disturbance, which can have negative consequences for their conservation. We have recently produced a new, free leaflet for paddlesport enthusiasts to provide them with information on how to enjoy their time in the Harbour and protect wildlife when they are out on the water. This will be available to pick up from outlets around the Harbour including the Harbour Office in Itchenor, or you can download a copy here.